Decoratively speaking, we can fix anything; it really is as simple as that. Give us your neediest rooms and we'll run at them, with gusto, transforming chicken poo into designer chicken pie at every single turn. Take this week's designer affront, a serious style offender. And be under no illusion; the hellish kit witnessed in our 'before' shot wasn't cheap; the sofa, alone cost several thousand bucks. And as for that Jurassic-sized TV? Let's not even go there. Practical crit' aside, righting wrongs during this project was a pleasure. Here's how, like heat seeking missiles in sling backs, we jiggled and wiggled our way through an undeniably gloomy living room... to end up in a beautiful world where the sun always shines. Ahead of any project, heed our maxim. We bring it out during private client adventures and in the jolly, oft-crazy land of TV. Consider daylight, footprint, budget and materials. Tip: having a contingency of around 10 per cent is wise, as costs generally escalate; the last thing you need is funding shortfall prior to completion. Assembling a mood board makes sound sense too; scan magazines, clip pictures from brochures then arrange and compare loads of samples before flexing your credit card. 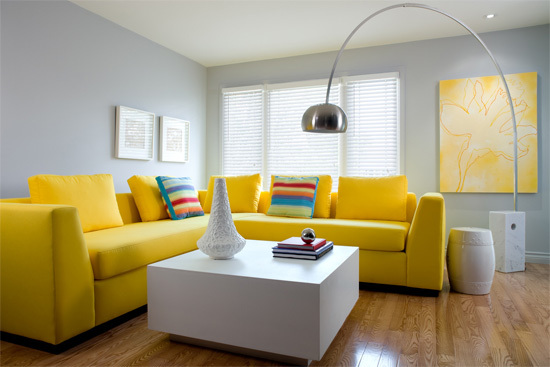 Consider paint colours, in situ, and analyze these under natural and electric light; you'll be amazed how shades appear to change as the clock ticks. Simple whisper grey, as a cool background for -- limited -- drama elsewhere. Always remember the three Ps; Preparation, Preparation and, erm, Preparation. Smoothing wall surfaces ahead of painting will increase the professional feel of your project. Also remember to avoid paint with sheen if you have stubborn surface imperfections; matte paint will help disguise minor bumps. Shine, on the other hand, will only serve to highlight irregularities. As far as colour is concerned, we find it better, generally, to avoid making schemes too complex by interfacing opposing primary colours. Better to anchor everything with a first choice bold tone, then control everything else thereafter. 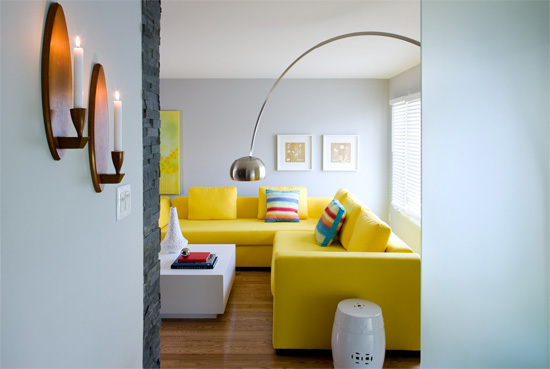 Cool soft greys and "default mechanism" whites are no-nonsense foils for big, overt decorating decisions like this primary yellow accent. As this room connects to a nearby kitchen, we used the same flooring in both zones to increase the feeling of flow and make each seem larger. This practice also avoids threshold bars which are a total red flag for us. Warm underfoot and resilient to scuffs and wear, our lacquered honey-toned lumber adds visual warmth to what is essentially, short of the sofa and artwork, a monochromatic scheme. Tip: invest in permanent features such as flooring that will remain perfect for years to come. These 'big buy' items should be relatively neutral so that subsequent schemes can be arranged without clashing or fussing. To evoke the dreamy feel of New England shutters (without the associated spend) we opted for Venetian wood-look blinds in a crisp, white finish. For similar product, try Rona who carry blinds in a host of sizes and colours to suit your scheme. Tip: when measuring blinds, always size into the window 'rebate' for a streamlined look; blinds out with this aperture are more likely to blow in the wind and look untidy. Yup, it's yellow. And why not? For too long our world has languished in "greige" (grey and beige) mediocrity, but we love battling this decorative fatigue. After assessing proportions, we specified fabric, sketched a simple L-shaped design and set our trusty upholsterer the task of creating this comfy lovely. Perhaps rather surprisingly, custom work is often around the same price as off-the-shelf kit. Plus, you get to tailor ideals to your own space. Tip: by following the custom route you can choose the type of filling that's inserted within cushions; we find that foam, wrapped in feather, is a perfect comfy combo but speak to your upholsterer to work out what's best for you. Hanging on pre-fixed batons, this tactile treat is a dramatic cornerstone in an exciting and thoroughly re-branded space. What's more, it's available in a host of gorgeous looks to suit each project. In previous work we've used softer colours and creamy terracotta shades but, to add drama, this grey solution was perfect. If a job's worth doing, it's worth doing properly. This in mind, we abandoned our initial labour-saving plan of hanging the new TV and fireplace on top of our stone wall. Instead, as floor space was adequate, we instructed our contractor to build a framework into which we "bedded" new appliances. Supervised by a C 'n' J squat team of professional electricians and carpenters, we were able to adequately meet safety requirements and avoid any heat build up from either item. Tip: wherever electricity or ventilation are concerned, never cut corners. Seek professional advice and study manufacturers' guidelines to the letter. An overhead spread of pot lights helped brighten proceedings, while a directional lamp added an extra jolt of design integrity. The light was inspired by the classic "Arco" lamp, one of which recently sold at a British auction for $3,000. This one was a whole load cheaper -- just $388! A bargain, if ever there was, and one with seriously cool lines to boot. Tip: check on line auction or shopping sites such as Ebay and Craigslist; you'll be amazed at what you'll find. Suitably illuminated, you've now no reason to languish in a benign sea of greige. Whether the mercury's journey is vertiginous or whether it slips south, be assured that new heights of jaunty décor can be attained courtesy of our considered counsel. Hey, the summer continues here!